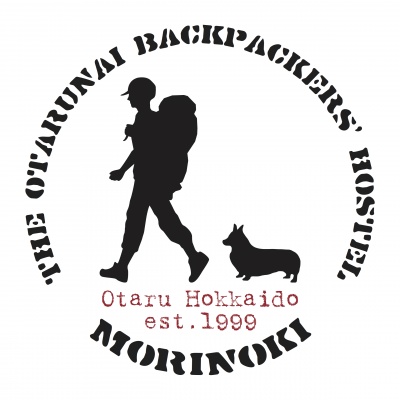 Today is my last day in otaru, in MorinoKi. Oyeon and I went to the 水天宫, it was peaceful and we could see the whole city. The view I saw was more beautiful than tengu mountain I thought ! Oyeon accompanied me in the afternoon to buy the music box. Masa ordered the pizza , bought beers  for oyeon and mayumi, Carbonated drink for me. Five days later is my birthday. Masa given me a gift. So sweet! Thank you for the goodbye dinner. A really nice experience as a helper in MorinoKi. Hope everyone can be happiness! If encounter difficulties, also be able to overcome. Hope masa can go to bed early! mayumi can have more time to do the things she like! Hope oyeon all the best one year in hokkaida! Best wishes to Masa, mayumi and oyeon. Still keep on walking in 2018! I was talking with mayumi, and a new guest, come form koren. 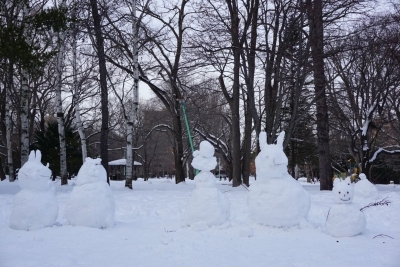 I was surprised that The student's winter holiday in korea is only one week! 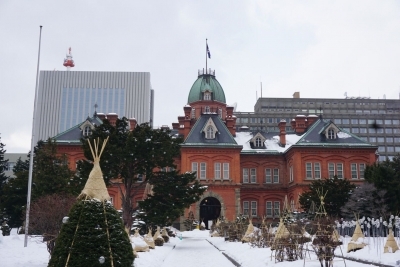 I had planed go to the otaru museum. On my way went to museum, I changed my idea. I took the JR train to Sapporo. When I got out the Sapporo station, I sayed, such a big city! 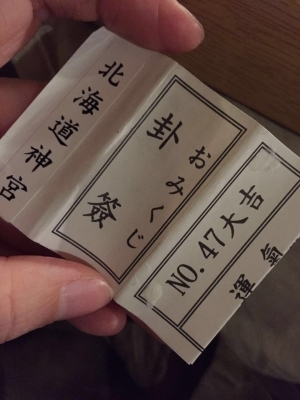 I received a fortune sticks from ほっかいどうじんぐう from masa friend. I opened it. It meaned 大吉，good lucky! I would keep it in my wallet! My destination was the ほっかいどうじんぐう. 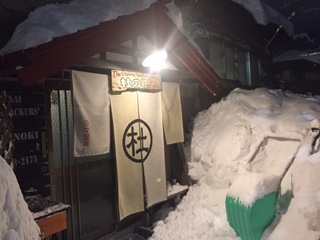 During the way I went to ほっかいどうじんぐう. I met the 赤れんが庁舎. The history of Hokkaido was full of sweat! 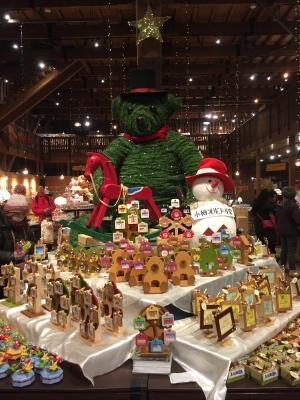 I was a little sad when I went back to otaru. Today after tomorrow I have to leave.I went to flower shop and bought hyacinth. 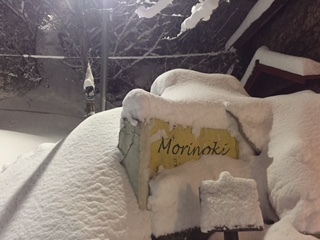 Hope everything will be ok in morinoki! The couple from island told me that they will travel around world until they have no money. It sounds so romantic! During traveling, They can know each self deeper. 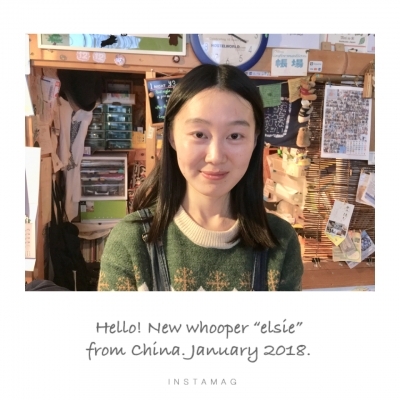 The girl from Taiwan left this morning. We share lots of interesting things about our parents. My companion told me that she will stay furano in July. Me too! 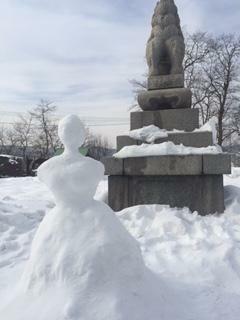 I recommended a old tv play, 北の国から, the story happened in furano. I have already imagined my summer holiday! Guesthouse is a interesting place. You can meet different kinds of people. They will bring you lots of new information! The Communication is a amazing part of journey. This afternoon I went to Tengu mountain! The snow was soft. I will go back Hokkaido to skiing! 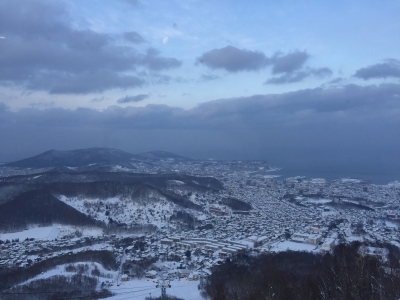 The view of the otaru from the top of the mountain is very beautiful. Today is a rainy day. Snow began to melt. The road is very dirty. 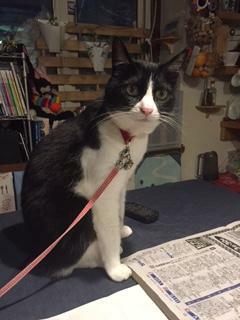 we finished the house work earlier than before. It was interesting to doing house together! We talk about the difference between china and Korea. 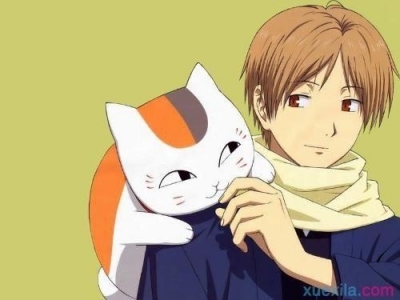 We love the same Japanese animation, natsume yuujinchou! 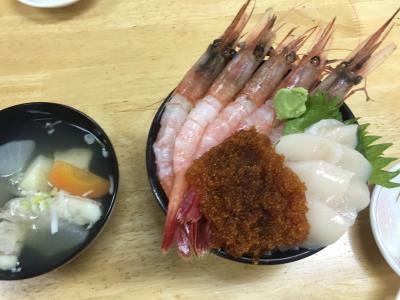 After finishing work, we come to the 三角市场。Although I do not like raw food, I want to try seafood.The fresh seafood in china is very expansive. It tasted good. Just once. I still can not accept raw seafood. We took number 3 bus at otaru station. 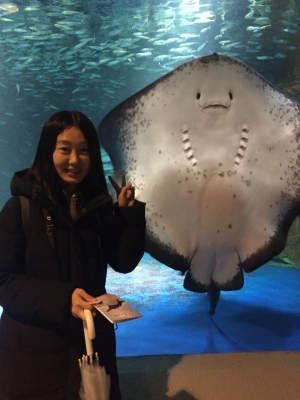 Our destination was otaru aquarium. Thanks for masa' coupon. The aquarium was the most interesting place for me. 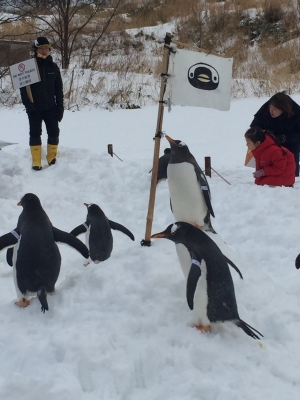 We saw the "smile"fish, かわいい penguin, and so on. 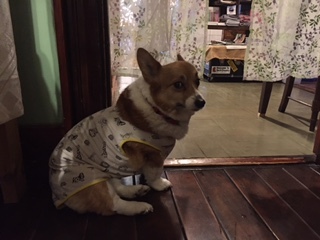 It was a little difficult for me to walk in a rainy day. When I saw the warm light in morinoki, I felt I come back to my home. Today is good weather, blue sky and white snow. The scenery I never see in Beijing. The pollution is serious in north of china. Nothing is special. Masa is busy with his work. Hug is always sleepy. 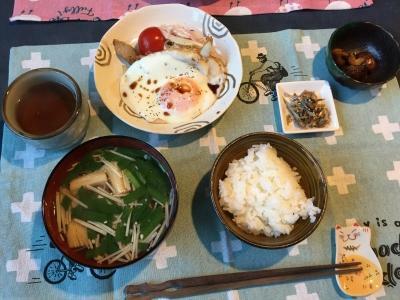 Mayumi's day off, so I can sleep until 7: 40 to help her prepare breakfast. 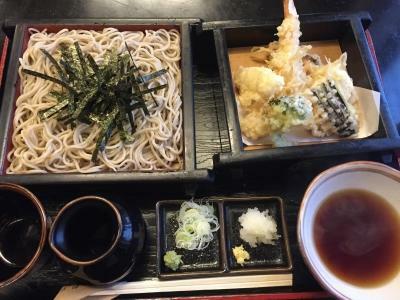 If i come back otaru, I will take some chinese condiment for her. 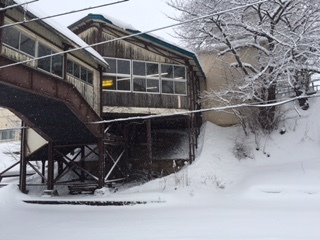 Because otaru snowed for a long time last night, the snow was thick this morning. 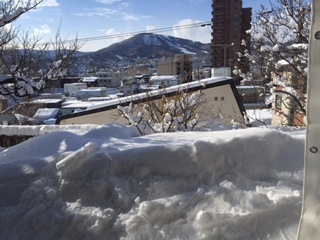 The snow is too thick, I thought that Mayumi and I would spend one day to clean the snow without masa' help. It was really amazing for me to Shovel snow! Ps. Another helper came, a lovely Korea girl. The next trip maybe more interesting. I arrived at otaru in 11 Jan. The city was snowing. 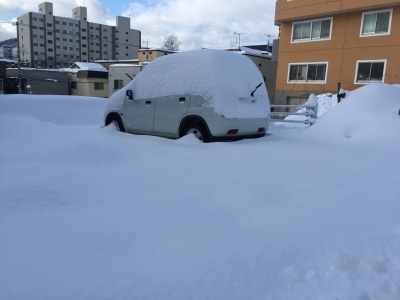 My hometown seldom snow. It was very amazing for me to see the city covered by snow. I have no sense of destination, so I lost my way in this small city. Lucky for me I met a grandma who were shoveling snow. She was very friendly although we have the language barrier. I found the Morinoki with her help. I met Masa, a very nice Japanese. It was surprising that hug is a dog and momo is a cat. I thought they were masa's colleages. Now I think they are masa's family members. At 4 pm, I bought basic necessities from the coop supermarket. I like supermarket because I can realize the local people's life. A nice beginning for me! Hope a interesting journey.